Discussants: Dr Ben Gidley (COMPAS, Oxford), Maurice Wren (Refugee Council), Paul V Dudman (Refugee Archives, UEL), Dr Rumana Hashem (CMRB, UEL), Sarah Menzies (Evelyn Oldfield Unit), Dr Toby Butler (Birkbeck and UEL), Dr Tom Vickers (Northumbria University). 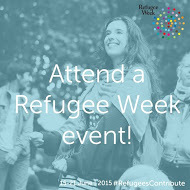 Are you interested in archives, history or refugee and migration issues? 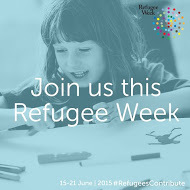 Are you a student undertaking research for a dissertation, an NGO-worker focusing on policy; an archivist interested in learning about “refuge archives”; a historian of population movements; an activist or community-group member actively working in the field to support your local community group or organisation? If so, then you may be interested in attending our Archives Open Day? We would very much like the opportunity to welcome you to a showcase of material from our unique and diverse archival collections and we are also very keen to use this day to discuss hoe are archival collections can be best utilised to encourage greater usage and accessibility beyond the confines of academia. We are very keen to make our Archives more interactive and engaging and we are hoping to take a step towards achieving this through a civic engagement and outreach project that we are currently running. Showcase materials for the Archive Collections at UEL, especially the Refugee Council Archive and associated collections. To encourage new groups and communities to attend this open day to discuss our latest civic engagement project which hopes to pilot a new Living Refugee Archive website developed through external engagement beyond the Archive and the collection of oral histories. To promote the UEL Archives to a wider audience beyond academia and to try and encourage new outreach and partnership opportunities. To consider the relevance of “Refugee Archives” in the 21st Century and to reflect on the collection development and management of such collections. The Archivist, Paul Dudman, will be on hand all day to provide advice on how to care for your personal archive collection including photographs and documents. You can also discover how to access the Archives at UEL for your own research projects and further study. If you are interested in using the archives for your research; to Improve your research quality and potential; or if you would like to discuss ways we can utilise the archives for your teaching; or even if you would like to discuss the possibility of forming a new partnership or helping with outreach or civic engagement activities? 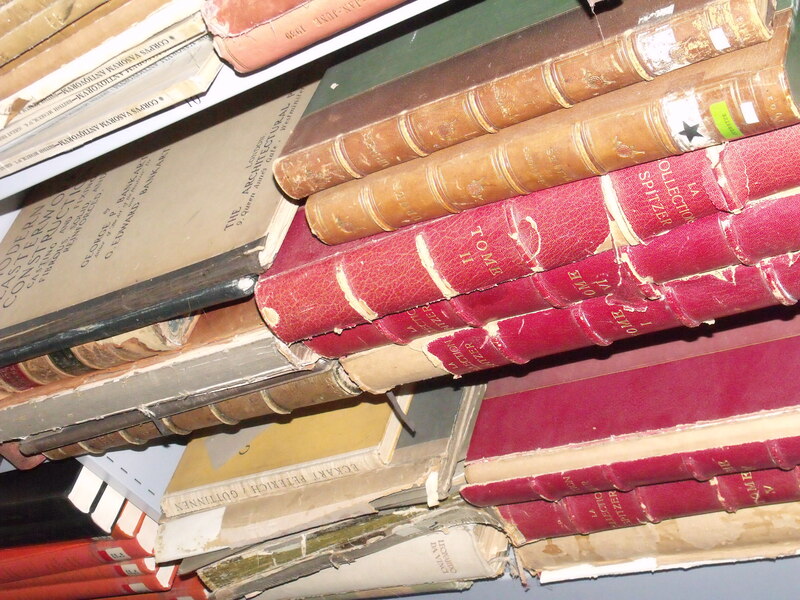 Or maybe you are just curious about UEL’s fascinating collection of archives and special collections? Please do get in touch and try to come to our Open Day! This is a free event and there are no charges associated with attending. If you require a car parking space, please do let us know and we can make the arrangements accordingly. The University of East London is currently the home of several high profile archival collections including the British Olympic Association Archive and Library; the Hackney Empire Theatre Archive; the Eastside Community Heritage oral history collection and the Refugee Council Archive and associated collections. Paul Dudman, Archivist, in conjunction with the Library and Learning Services at the University of East London. We are pleased to be able to circulate details of the forthcoming Eastside Community Heritage Lecture Series for 2015. The lecture series will begin on Thursday 26 February with a talk give n by Jan Pimblett from the London Metropolitan Archives and wil continue with talks from Sara Griffiths from The National Archives, on Thursday 28 April, and Arthur Torrington CBE on the 24 September. The events are free but booking is recommended. Full details of each of the speakers and the subject of their presention are available to download from the Eastside flyer for futher information: Eastside Community Heritage Lecture Series 2015 flyer (PDF File). 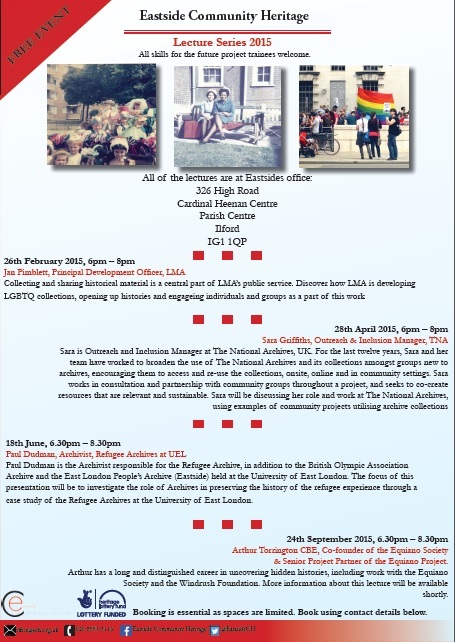 case study of the Refugee Archives at the University of East London. Also available are DVDs on East London local history produced by Eastside Community Heritage comprising Eastside voices: from Canning Town to Custom House, 2003; My Roots, Our Heritage, 2006 and Our Brick Lane, 2007. Published books and booklets on East London local history, chiefly published by Eastside Community Heritage including A Working Class War and Hidden Lives: stories from the East End and an index to photographs collected as part of projects by Eastside Community Heritage comprising of black and white thumbnail reproductions. Please contact the UEL Archives on library-archives@uel.ac.uk for further information on how to access these materials. 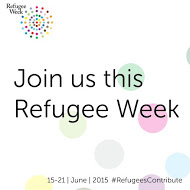 As the new term is now officially underway, we would like to take this opportunity to highlight the services and resources available as part of the Refugee Council Archive here at the University of East London. My name is Paul Dudman and I am the Archivist here at UEL. 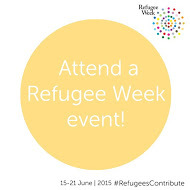 The origins of the Refugee Council can be traced back to 1951 with the creation of the 1951 United Nations Convention Relating to the Status of Refugees. In the United Kingdom, the response to the 1951 Convention was the founding two independent organisations, British Council for Aid to Refugees (BCAR) and the Standing Conference on Refugees (SCOR), which were later to be merged to become the British Refugee Council. 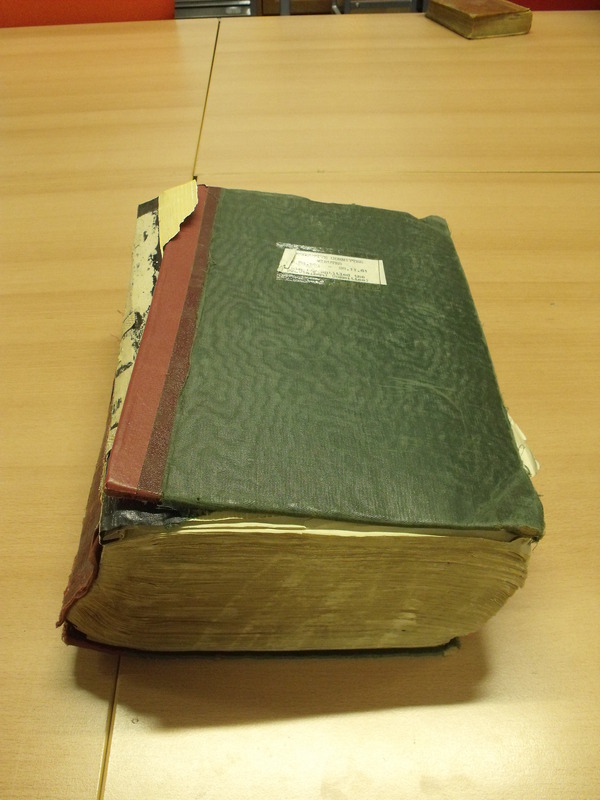 The Refugee Council is now one of the largest charities dealing directly with refugees and asylum seekers within the UK, and the Refugee Council Archive at the University of East London now represents one of the largest collections of materials relating to the study of forced migration and the refugee. It is a source of information and analysis on displacement, flight and exile; on legal, political and social issues; and on refugee community life. 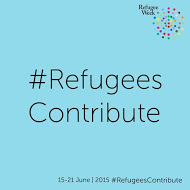 The UNHCR Audio-Visual Archive. 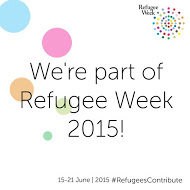 A selection of Photographs, Slides and Audio-Visual materials collected by the UNHCR London office. The Northern Refugee Centre. The Archive contains a range of published and unpublished materials including reports, conference papers publications, grey literature and press cuttings. Charter 87. Incorporated within this are minutes of the Charter 87 Steering Group; records of correspondence predominantly with the Home Office; records of the organisation’s newsletter and occasional publications and files of press cuttings relating to asylum seekers and refugees. We are committed to provide a range of services to both undergraduate, postgraduate and research students and staff at the University of East London and we also welcome enquiries from external researchers and members of the public. We endeavour to make our Archives as open and accessible as we can and to do this with developed a range of services which we hope will help support our Archive users. These services can include the provision of Individual and Group Archive Induction and Guidance Sessions for undergraduate, postgraduate and research students whilst we are also happy to seek to engage with our academic community through the provision of one-to-one and group teaching support combined with activity engaging with e-learning activity through the utilisation of our of archives and special collections, both physical and digital. We are keen to embed our Archives within UEL academic courses and we would welcome any expressions of interest from UEL academic staff who may wish to make use of our Collections in support of their courses and learning and teaching requirements. We are always looking at ways in which we can develop our Archives to support the learning experience of our students. Online access to our Archival descriptions at: Archives Hub and AIM25 and Archives Portal Europe websites. 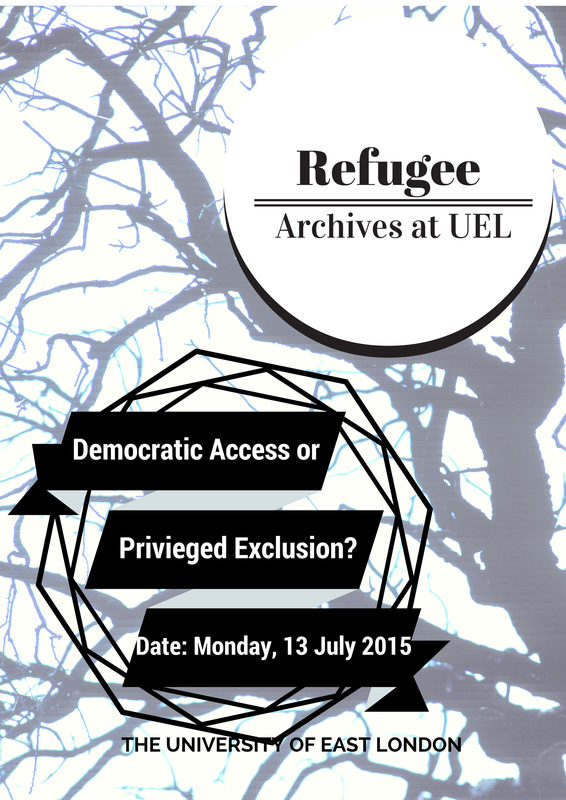 Dedicated Twitter Accounts for the UEL Archives (@ArchivesUEL) and Refugee Archive (@refugee_archive). A Jiscmail Refugee Research Listserv. We would strongly recommend that you have a look at some of these resources and we hope that you will find them useful and rewarding. We would also recommend any feedback on the range of services that we offer here at the UEL Archives and do please get in touch with any question or query that we may have. Archive opening hours for the UEL Docklands Campus Archive will be Mondays to Fridays: 1pm to 6pm for a drop-in service. 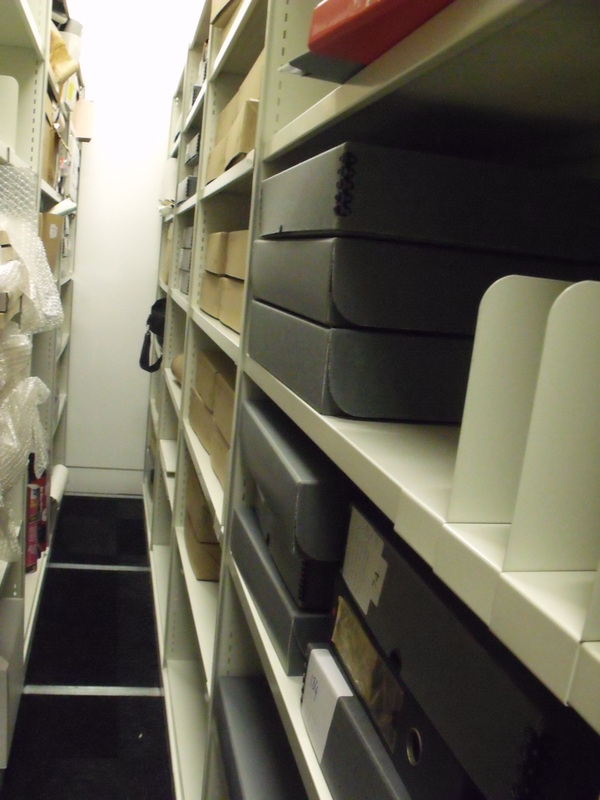 Access to the Stratford Campus Archive for the Hackney Empire Archive is by Prior Appointment Only and morning appointments can also be made for the Docklands Archive between 10am and 12pm. To contact the Archivist to make an appointment, or with any other query, please contact: Paul Dudman on 020 8223 7676 or by email on library-archives@uel.ac.uk.